Not many people cook with cast iron anymore because of the invention of non-stick pans but cooking with cast iron deserves another look. The non-stick pans are great to cook with but the chemicals that make the food not stick to the pan may be harmful to humans. I decided to start using cast iron pots and pans last year when I inherited an old pot that was my great aunts. I cooked some venison stew in that cast iron pot and after enjoying the best stew I have ever made I was sold on cast iron. 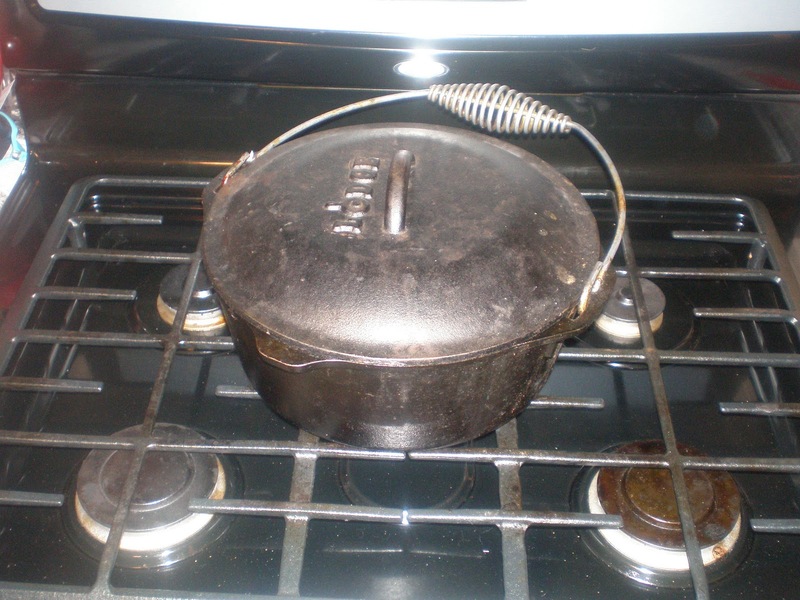 I have cooked everything from deep fried perch to venison sloppy joes in that good ole fashioned pot and it all tastes better with cast iron. The trick to cooking with cast iron, is to start off with a seasoned pot or season it yourself. The majority of the cast iron pots sold today come pre-seasoned. If you come across an old gem like I did, you will have to season it yourself. To season the pot, you simply buy some vegetable oil or lard from the store. After applying your choice of oil or fat to the pot or pan, pre-heat the oven to 375 degrees and put it in the oven. I like to put a cookie sheet under the pot so the oil doesn't make a mess at the bottom of the stove. Leave the pot in the stove for 45 minutes. Once you pull it out, the pan will be seasoned to perfection. Once the pot is seasoned, do not clean it with soap. The soap will break down the seasoning process and you will have to start over. I scrape out the food with a plastic scraper my dad gave me and then clean the pot with hot water. Once the pot is clean, I dry it with a towel and then spray a shot of cooking oil in it and put it away. I find that the cooking oil keeps the pot from rusting up and my pot is always ready to go when I get ready to use it. Once you start cooking with cast iron, you will realize that a cast iron pot or pan will not only last forever but will outperform all other types of cookware. Food cooked with cast iron tastes better, doesn't burn as quickly and sticks less than a non-stick pan without the side effects.